HÀ NỘI — Benefit sharing is the best and most cost-effective way to protect forests and the livelihoods of forest-dependant people, but many localities are struggling to reach consensus on how to implement this solution. The information was revealed at workshop entitled ‘Sharing benefits from forests with local communities - challenges and solutions’ held in Hà Nội on Wednesday, organised by Vietnam Forest Owners’ Association (VFOA), Việt Nam National University of Forestry (VNUF) and the Centre for Indigenous Knowledge Research and Development. Speaking at the workshop, Hứa Đức Nhị, chairman of VFOA, said benefit sharing in forest management with local communities have been piloted in Viet Nam’s forest and seafood sector. But there were many obstacles in the implementation, including a lack of guidance. Nguyễn Vũ Linh, deputy director of Bạch Mã National Park said they met difficulties in procedures related to land registration and for exploitation of forest products, excluding wood. A lack of responsibility among the park’s staff and self-awareness of the community was also a problem, he said. 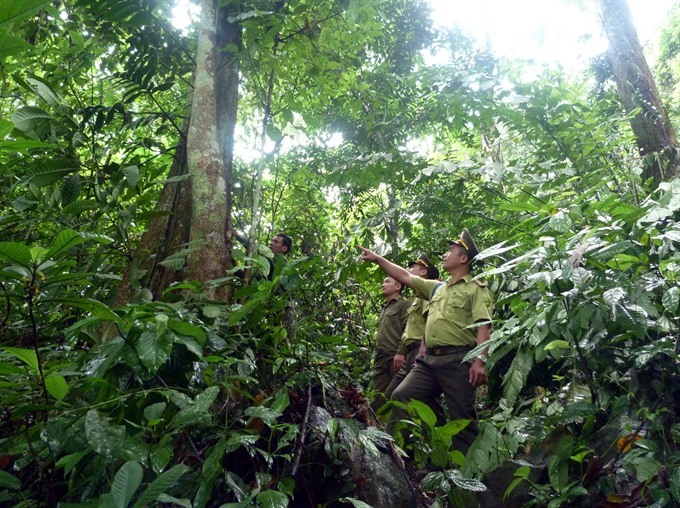 Bạch Mã and Xuân Thủy National Parks were the two parks chosen to pilot the benefit sharing in protection and sustainable development of special use forest by the Ministry of Rural and Development. Xuân Thủy National Park is one example of effective harmonisation of conservation and development. A co-management mechanism between the park and the local authority and communities was established during the implementation of a clam farming model in Con Lu ecological rehabilitation zone. Accordingly, Giao Thủy District People’s Committee was assigned to support the park in signing contracts for benefit sharing, allowing the community to use surface water areas for clam farming. The committee also collects payment for forest environmental services and hands in the environmental fund to the park to be paid to beneficiaries. The model in Xuân Thủy National Park has showed that once a forest is managed well, biodiversity and living conditions for local residents are improved, while water supply for daily life, agriculture and hydropower and irrigation work is ensured. The pilot has proved enhancing local community ownership results in positive changes in awareness that helps them behave better towards management of coastal resources. In other words, it’s a win-win solution. The co-management policy has also reduced conflicts among residents and park staff. Local residents can still exploit resources, but in a more sustainable manner. By working with locals, the park was able to oversee resource use activities through a peer monitoring system. Nguyễn Thành Chung, director of Đắk Tô Forestry Company, said with the benefit sharing mechanism, the forest was managed better than before. He admitted capital funding for forests was limited, while deforestation and forest encroachment still existed. The company has been involved in sustainable forest management and protection project since 2012. It has assigned contracts to hand over 8,000 ha of forest to the community and recruit dozens of local workers to protect forests. Chung said co-management was the sole solution to protect forest and sustainable development. It is estimated there are 5.5 million households living close to and depending on the forest. Participants at the workshop affirmed the local community in each region has different ways of accessing forests, requiring close management. Otherwise, the benefits would be easily lost. While agreeing that participation by locals was essential to any conservation effort, they also emphasised the need to ensure sustainable development.